This is a typical Australian nativity set suggesting the harsh sun of the outback and the down-to-earth existence of early settlers. A new frontier has been conquered; soon the old life will change and new rules will apply. Still, for a moment of unique harmony, there is no separation and there are no social classes. The kangaroo has the monopoly of the shed, the aborigine is in charge of the music, the rice farmer with his weighty gift holds back and plays modest. Lamb and parrot seem to be of one mind, and so is the holy couple, the redhead Mary and the mustachioed Joseph. Is this the ultimate frontier we will ever reach? A moment of harmony within, and the dream of peace for the whole world. There seems to be more, judging from the “real presence” in the manger. Nativity set created in Australia in 1999 by Jenny Miller, made up of terracotta figurines. Exhibition label written by Fr. Johann G. Roten, S.M. 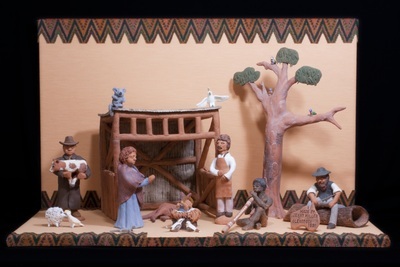 originally for exhibit entitled "Elisabeth’s Nativity House: The van Mullekom Collection" held at Roesch Library, University of Dayton.